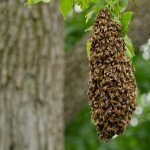 Ok, so, a bee swarm occurs when the hive becomes too big (during high season–spring and summer months). In high season, a single hive can have between 60,000 and 80,000 worker bees….and only one queen. During this time, a new queen will be “in the making”, while a number of “scout bees” set out in search of a suitable place for a new colony to form. Once they have found the right place, before the new queen emerges in the existing hive, the scout bees guide the “old” queen and about half the worker bees to their new location. This is how the swarm occurs. Before leaving their original colony, the bees will fill themselves up on nectar to sustain themselves during their travels. Once the swarm has left its old nest or hive, this is when one might see a whirling mass of swarming bees in the air. The queen is not the strongest of flyers, so inevitably, she will need to rest at some point – perhaps on a branch, post or fence…or on the head of a sunflower! The reason a bee swarm looks like a clump of bees, is because all of the workers are gathered around the queen, hence forming a clump. This is a natural part of bee life. PLEASE DO NOT ATTEMPT TO MOVE OR DESTROY A SWARM AND PLEASE DO NOT USE POISONOUS INSECTICIDES ON THEM. Our bees are critical to the eco system and our food supply. To SAFELY REMOVE a swarm, PLEASE CONTACT A PROFESSIONAL BEE REMOVAL SERVICE. One such company is bee-friendly-bee-removal.com. Swarm on, beeloved friends! Namaste!